Rich is a wresting coach for the school now. He is mostly involved in the elementary children’s team, but he also tries to help out with the High School team as much as possible, too. David and Caleb are in the younger group, and Jacob and Ethan are in the older group, so they are getting a lot of good quality time with their Dad. There are H.S. wrestling tournaments every Saturday and I went to one. It was awful exciting, but way too much for me to watch both the matches and the little ones (bounce around the bleachers) while Rich was off in another world (a wrestling world). I left that day with a splitting head ache and ready to tear my hair out from keeping track of kids and watching my big sons wrestle (disturbing). I stay home on Saturdays now and Rich goes to the tournaments with Caleb and Seth. This leaves me with Grace, David, and Sarah, a combination of children which is quiet and calm, perfect for a lovely soothing Saturday at home. Lately, with my sister Amanda’s children getting sick one after the other over and over, and me with my emotional problems, we have both of us (sisters!) started declining slowly into a sad state of winter BLAHS. Tired, sick, and sick of being tired. The remedy was quite simple, really, and began with a texting back and forth on Saturday morning. I convinced her to come over, even though she had been up most of the night with her sick son. We left Sarah with Grace, David, and my niece Abbie, and went downtown together. 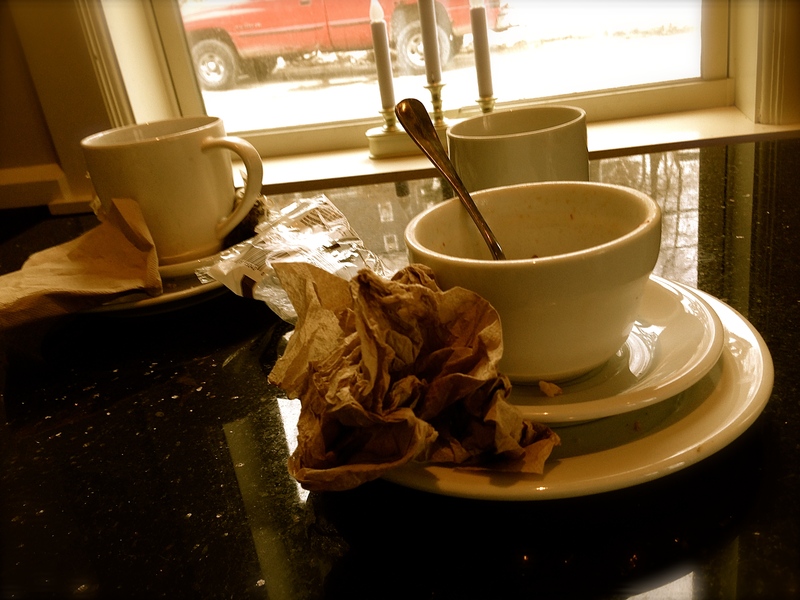 We began at the coffee place, where she had tea, and I had coffee. We had bagel sandwiches and while we ate, we talked and talked and talked. We went next door to a sweet little shopping place that is very much like Anthropologie, with beautiful goods to tempt us. 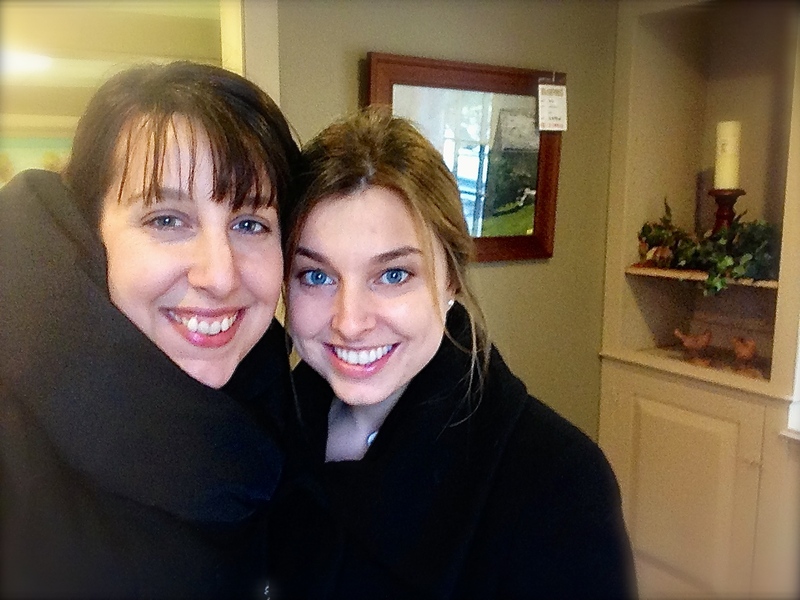 Franceen, the store owner, knows me by my first name and was so happy to meet Amanda. “My daughter’s name is Amanda! Oh, your mother has two beautiful girls!” she exclaimed. We both came away with a bag of delightful things, including packages of hot chocolate and special homemade marshmallows. Feeling a little less tired and little more beautiful. We went to a vintage clothing store next and tried on fur shawls. “I look like a bear in this!” She made me laugh. I bought a blouse and something for Joanna’s baby boy to be born in February. 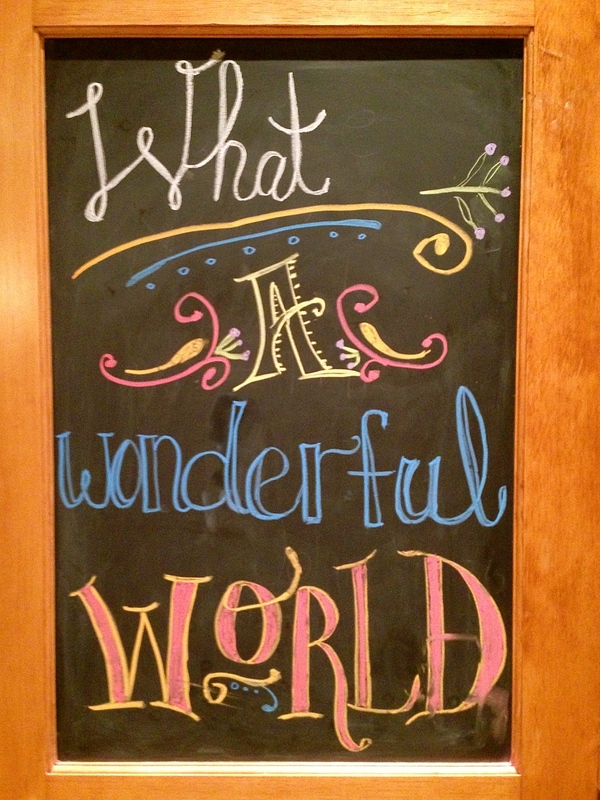 Before heading home, we bought chalk to decorate the chalkboard that is on my pantry door. 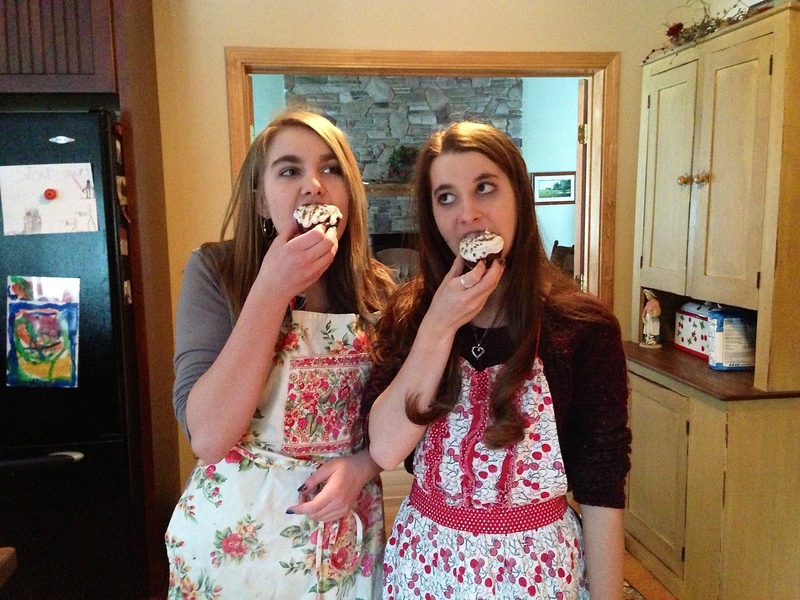 We arrived home to find the girls in the midst of baking up a quadruple batch of chocolate cupcakes. 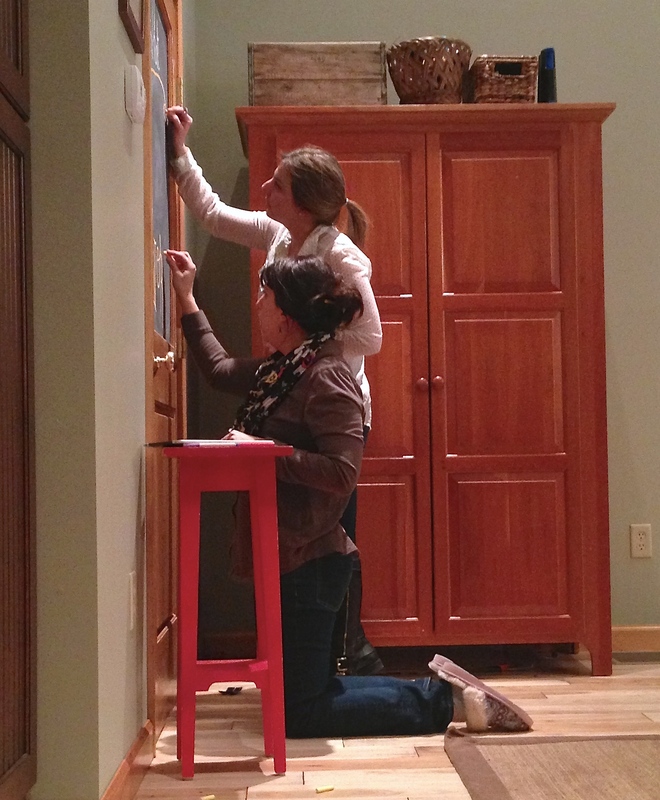 Amanda picked out a design inspiration on pinterest for the chalkboard and we set to work. It was satisfying to create something together. Oh yes, and it was easier to believe, after a sister-day. This entry was posted in family and tagged sisters by Shanda. Bookmark the permalink. 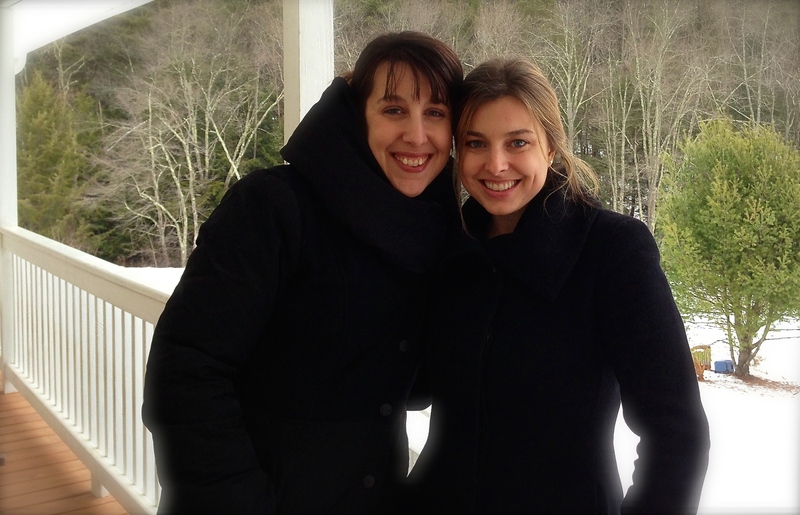 How wonderful…a sister day! This time of year can bring on the blahs. I’m okay, but come early March…I’m ready for open windows and flowers! Sometimes a sister day is the only thing that will do. Don’t believe Elizabeth, chicago is way too cold! She’s trying to cure her own misery by luring you in! 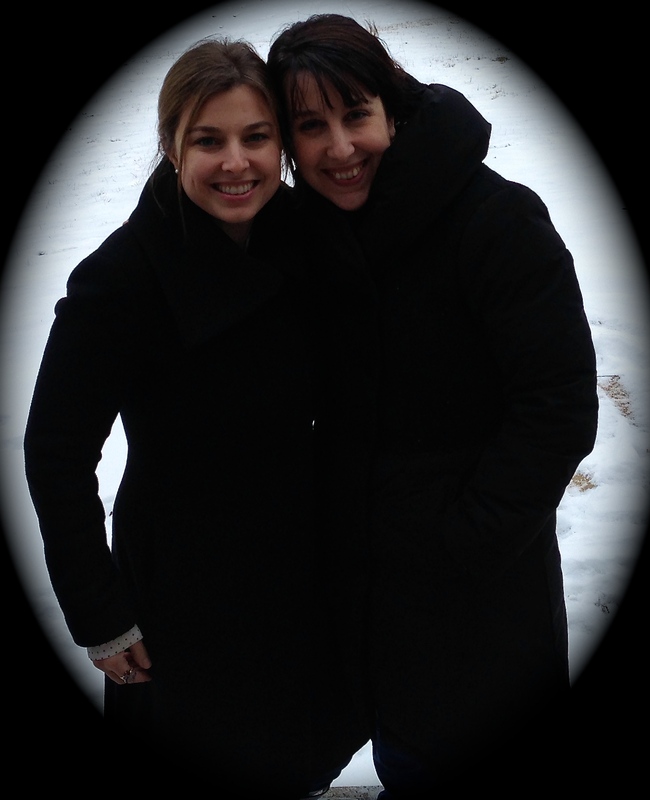 so wonderful to be so close with your sister ~ what a special day! Oohhh! How blessed you are! I missed out on a sister. Mom brought home a baby boy twice. First time I asked where the girl was, the second time I said I wanted a sister and cried! Poor mom! Good times! Such sweet pictures, and what a wonderful remedy for the blah’s! I can feel the love-vibes coming off of this post. Sister-love is so sweet. Makes me miss my sisters. hi shanda……..good to have you back with a new computer! glad you could spend the day with your sister to cheer you both up. maybe I need a day like that – I certainly have the winter blahs as well. it’s beyond cold around here! What a beautiful post! It’s so good to read one of your posts again and to see all the lovely pictures. Welcome back! 🙂 How wonderful to have sister time. I am so happy for you that you have such a precious relationship with her…..and that your kids enjoy their cousins! We have a couple old doors that would be perfect for this!!! AND they’re both boys’ bedroom doors. I can imagine them leaving goofy boyish notes to each other as they get older… or I could leave them a quote here and there for inspiration. I think I may steal this idea.